This is for the Board Only! Be sure to be comfortable with surface mount soldering! So you just got your brand new Raspberry Pi Zero and now you want to have a keyboard, mouse, and maybe some Wifi, wouldn't that be nice? The PiAngle safely powers the Pi zero and at the same time adds 4 USB Type A ports. All without any soldering to the Pi Zero board. 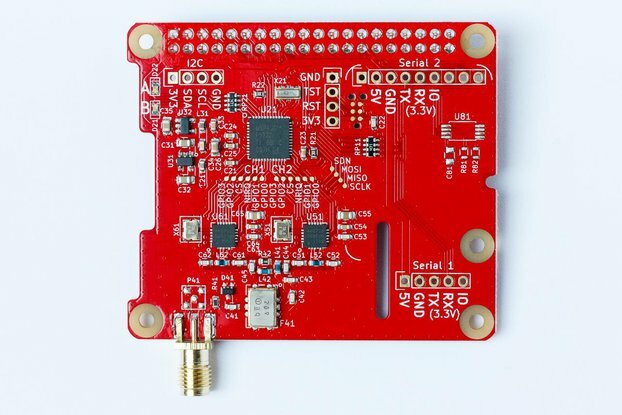 This unique design takes advantage of the Pi Zeros multiple USB B Micro connections. The USB OTG becomes a 4 Port USB Type A, while the power USB receives a solid 5V. Similar to the regular Raspberry Pi the Pi Zero requires you to power it via a USB B Micro port. 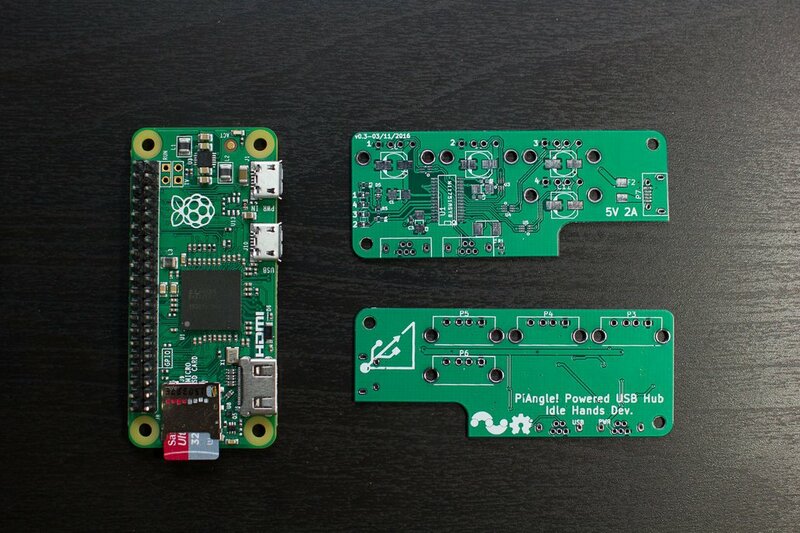 The PiAngle supplies the Pi Zero with a 5V source. This source is only input through the Power USB on the Zero. 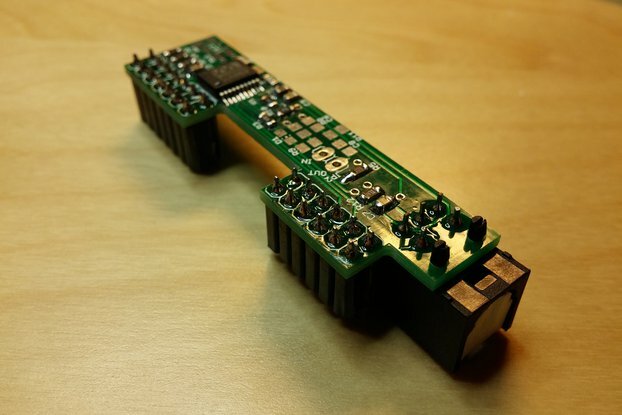 The USB OTG is isolated from the PiAngle's 5V source. The reason for this is simple. The makers of the Raspberry Pi have a very specific way they like to see the Pi Powered. All of their specifications happen after the USB Power port. If you were to power the USB OTG port you would be essentially bypassing their standards of power(fuse, regulation, diodes). By isolating the USB OTG you are safely keeping the power source running through the correct path that was meant for the Pi. This limits the possibility of damaging your pi. Most USB Hubs will not do this and therefore you will be powering the Pi directly from the Hub itself even if you disconnect the Power USB. This is essentially bypassing any safety standards that have been built into the Pi. Another benefit to the single power line is you don't have to plug each device in separately. Often when plugging in a Powered USB Hub you have to first power it up, then plug it in, risking a restart. This will power everything at the exact same time. Note: The PiAngle is fused for 2A, anything more than that from the power input will burn out the fuse. The power supplies supplied will be rated at 2A. This would be an extreme case, please be realistic when powering devices from this Hub! 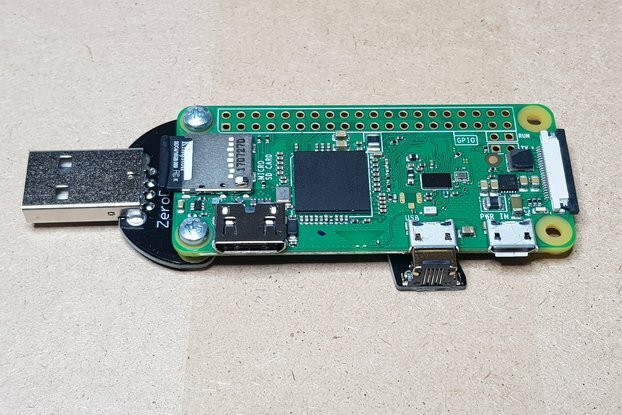 You may have noticed a small problem when using the USB OTG Port on the Raspberry Pi Zero. If you try to Hot Swap it, i.e. plug something in while the pi is running, there is a high probability it will restart your Pi. This problem is at the least very annoying, and at the most will corrupt your Bootable SD Card and no longer allow your SD card to boot, which requires a new install of your OS. This can happen when a Raspberry pi is not shut down properly. The problem stems from the fact that there is a sudden current surge from the USB device that was plugged in. The Pi Zero has no protection on this and when there is a surge it drops the voltage of the system and the Pi restarts. The PiAngle has protection from this. It will allow you to Hot Swap keyboards, wifi devices, bluetooth, you name it. This is very handy. It gets quite old when you keep accidentally restarting your Pi. This will happen no longer.